Stop on by and see why we will take care of your vehicle! Where Precision Is Not Just Our Name, It's The Way We Do Business! Since 1962, Precision Auto Repair has provided motorists in the San Francisco, CA 94117 area with comprehensive auto repair services that include Brakes, Car & Truck Care, Domestic Cars & Trucks, Electric and Hybrid Vehicle , Electrical Services, Electronic Services, Engine & Transmission, Engine Maintenance, General Services, Heating and Cooling Services, Import Cars & Trucks, Miscellaneous Services, Tires, Towing, Transmission Services and Undercar Services. Our goal is to offer the best services available at affordable prices to get you back on the road in no time. For a high-performing vehicle, trust Precision Auto Repair with your car, truck, or van. To learn more about the services we offer, please contact us by phone at 415-921-3317 or send us an email. We also invite you to learn more about our dedication to you, our valued customer. Joe Rodriguez opened the doors of Precision Auto Repair in 1962 with the intentions of giving people an honest and reliable place to bring their cars in for repairs. 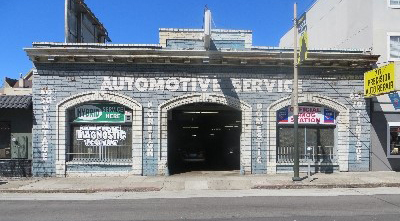 Nearly fifty years later Precision Auto is one of the oldest independent repair shops in San Francisco and has held true to its original mission statement since opening its doors. The longevity of this shop is a testimony to its high level of service and customer satisfaction which has always been our highest priority. Here at Precision Auto we offer a wide variety of services covering all makes and models as well as your vintage automobile. Whether it's a small repair or a major overhaul we can help keep you on the road and feeling safe. We are also fully trained in all aspects of diagnostics and electrical repair and have at our disposal the most sophisticated equipment and information available. Have more than one vehicle? Have many? We can help keep your fleet on the road and working for you with the minimum amount of down time, this includes heavy duty work trucks and vans with auxiliary gear such as hydraulic lifts and such. Please feel free to call us as we are glad to help you understand the problems your car may be suffering from. We always like to keep our customers informed along the way and to work with them on a personal level and make sure they know of their options and priorities. We would like to note that with 5 technicians our combined auto repair experience is nearly 200 years. Back to Canada, we want to thank you for the great service we got from you. Our wipers are now fully reliable . We certainly appreciated the prompt execution of the work and on time delivery (actually even better than promised) . Please find the photos Maria took of the event. I've been a customer here at Precision for 15 years now. John is an expert mechanic. He is very thorough in his explanation of your cars problem and always tells you the best option. Fair pricing and prompt expert service make Precision the best place in SF for car repairs. My car overheated twice on my way up from Los Angeles. When I finally arrived in San Francisco my friend who lives in the city told me to immediately call John at Precision Auto Repair, and now I know why. John is incredibly knowledgeable, patient, kind, honest, and generous with his time. He gave me valuable tips to help me get my car back to Los Angeles safe and sound. I highly recommend seeing him if you have any issues with your car. I am not a Yelper by nature, but I had to get on here and write a review because I have never had such wonderful mechanic service. I called and they told me to come in immediately and John went for a test drive with me, he looked at the car right away and we had a solution with in two days. It was amazing. I am so glad I now have some one I can trust and know values me as a customer. I can not recommend them enough. They are great! I brought my car in because of a weird noise inside the wheel. Precision Auto Repair fixed that quickly (it was just a screw that I picked up on the road and got stuck in the brakes). While looking at my car, the technician suggested that they could greatly improve the appearance of my headlights. I was a bit suspicious, having bought a kit and tried to do it myself. They went ahead and did the work after expressing confidence that my lights could be improved -- it was a bit pricey (around $300), but by golly the work was spectacular. My car hasn't looked so good is a long time! I have to agree with all the good reviews -- I had a great experience today. I had a flat tire and was able to have the whole thing taken care of while i was having lunch next door. John was very professional and I couldn't be more satisfied. There are some businesses which just compel you to write a good review. I was stuck near divis with a dead battery and I walked up to several places where I was rudely told that they won't lend me their jump start kit. Then I walked into precision auto repair and John without batting an eyelid told me to take his portable jumpstart kit back to my car and even gave me his card incase I ran into troubles using it. I jumped my car and brought into his garage where he replaced my battery and verified that there were no other electrical drainages. No appointments needed. He was very thorough with communication and had a very humble and honest attitude. John exudes a calm and patient demeanor -he listened sympathetically to my struggles at other repair shops regarding my Mazda 3 hatchbacks broken lighting system and to my somewhat convoluted backstory. In the same day he took my car and just three hours later he had not only fixed it but gave me a clear explanation as to why I have been on the odyssey of the broken headlight all this time (6 months). He took the time to get to the root of the problem instead of blindly replacing the entire system. This saved me a minimum of 1,000 in parts and likely more in labor. I am mostly touched by his kindness...if you are feeling like you want a trustworthy mechanic take your car to Precision and you will feel like a valued customer.